How to derive the slope angle value from DEM? I am trying to calculate the steepness of each pixels (30m) from the DEM of 2m resolution. 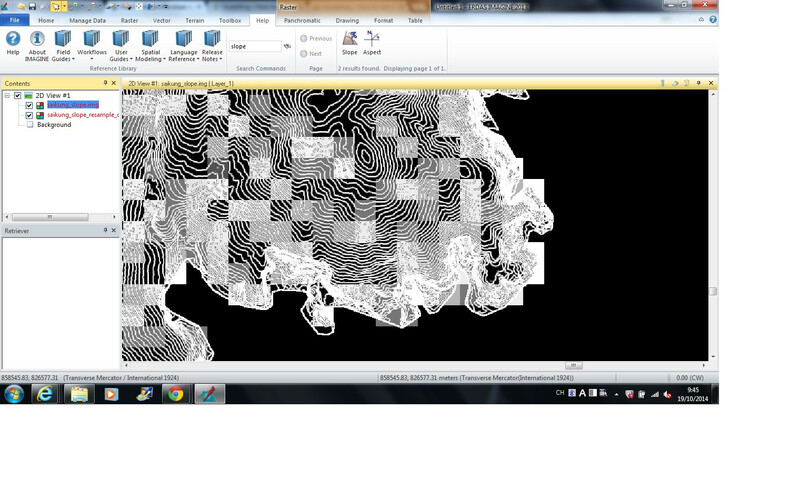 I have made use of ERDAS Imagine - Slope function and returns a contour-like pixel image. The pixel value between contour is null in value. I have also tried to resample the slope image to 30m pixel but i don't know why many pixels return null value even it is overlapped with lots of contour-like pixels. Are there any method to calculate the steepness of each pixels in the DEM? What i want to do is to make use of DEM to filter the flat area in the image classification. Have you though of just using the free GDAL tool? It can run in windows using OSGEO4W and can ouput .img files. From Spatial Modeler: This model is found in the file <.IMAGINE_HOME.>/etc/models/Slope_percent.gmd. From Image Interpreter: Select Topographic Analysis... | Slope.... Under Output units select degrees / percent or similar. To view or edit the model, click the View... button in the Surface Slope dialog. http://community.hexagongeospatial.com/t5/Spatial-Recipes/Quadratic-Method-for-Slope/ta-p/1913 includes an alternative Slope method. Not the answer you're looking for? Browse other questions tagged remote-sensing erdas-imagine or ask your own question. How to create an image of maximum pixel values from an input layer-stack image in ERDAS Imagine? How to aggregate/resample a higher resolution image to coarser resolution using defined threshold?